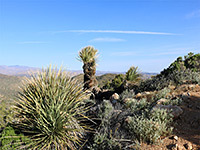 Black Rock Canyon, in the northwest corner of Joshua Tree National Park, is a relatively high elevation area reached by a paved road from Yucca Valley on Highway 62, and it has various facilities including a campground, stables, ranger station and several trails. 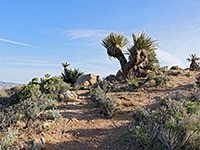 Most used is the Panorama Trail, heading south and linking with several less-used routes east and west, and there are also two short, easy loops, the High View and South Park Peak trails, both climbing to minor summits in the surrounding Little San Bernardino Mountains. The former is slightly longer, at 1.3 miles, climbing 400 feet up a ridge then descending an adjacent valley. Notices along the way describe some of the local plant life and geology. 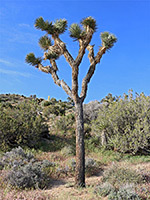 This section of the park is home to plenty of Joshua trees, mixed with a good variety of other plants including nolina, yucca and many wildflowers. Black Rock Canyon topographic map. 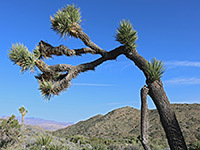 No payment is required to enter the Black Rock Canyon section of the national park. 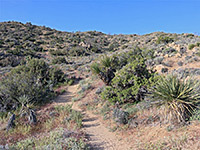 The High View trailhead is at the end of an unpaved, half mile road that forks west just before the entrance to the tent/RV campground; past the horse camp and up a gentle slope to a parking/picnic area in a little basin, with hills close by to the north (course of the South Park Peak Trail), and higher ground a little further away to the south. The road runs right along the park boundary. 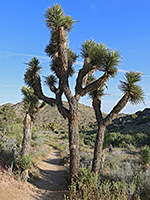 The path heads south and immediately forks; clockwise is the recommended direction, along a path that soon crosses the West Side Loop Trail and continues across flat land covered by Joshua trees, pinyon pines, juniper and other bushes. It then starts the ascent, climbing in stages up a ridge, past some intermediate promontories to the high point, site of a register and a bench. 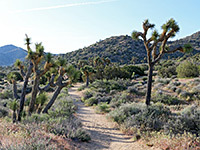 The return section is steeply down at first, into a valley, and then more level, passing some more large Joshua trees and then another intersection with the West Side Loop before arriving back at the start. Common wildflowers include fiddleneck, chia, blue sage, pincushion and several types of cryptantha.